Space saving goes beyond the filing cabinet. To get the most out of the space you have, look beyond boxes and shelves and start applying these record management best practices. Here are four records management best practices that your organization can apply to decrease storage costs while increasing storage space. A good retention schedule is the key to saving space. An effective records retention program can help you reduce storage costs because the schedule allows you to know exactly what you need to keep and for how long. This will also help you control the growth of your records, ensuring that you aren’t paying to keep records that your organization no longer needs. Studies show that between 50-70% of the records found stored in the office of any given organization do not actually need to be retained. Non-records like duplicates; drafts and notes take up valuable storage space and will most likely never be needed after creation. Getting rid of these types of documents saves valuable space when it comes to records management. 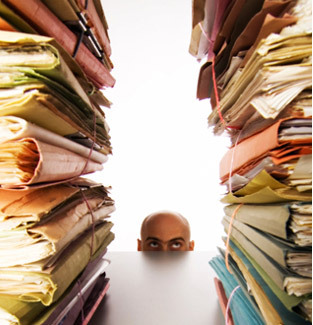 Just because documents need to be retained, doesn’t mean they need to be retained in your valuable office space. If your documents need to be kept for a certain amount of time, but aren’t accessed on a regular basis, look into off-site storage. Off-site storage facilities provide an alternative for keeping these records in office, allowing you to free up office space and still retain the documents your organization needs to keep. Digitizing of paper documents to digital is a great way to save space and cut storage costs. Paper documents are scanned to digital files that are stored in the Cloud or on DVD. These digital files take up way less space and are easier to access that their paper originals. Then, originals can be destroyed and you can start getting rid of those file cabinets.